We pulled into the Red Hut parking lot Saturday morning to get some breakfast. 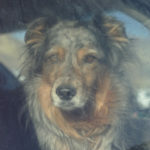 In the pickup next to us this puppy watched use carefully through its tongue-licked window. It was worth a pause for the shot. The dopamine hit we get from interacting with social media is addictive. FB knows this (hence Facebook and Instagram). Google knows this (YouTube anyone?). I suspect many other companies know it and use it. A favorite IG’er, @NateArizona, posted a chat on IG recently and talked about this. It made me think (or rethink) my use of social media, particularly FB, IG, Twitter, and SnapChat. I’m not a big user of any of them, with the exception of IG. But I limit my exposure to IG in that I follow only a few posters and they are either family, friends, or a few photographers whose work I admire. I mostly post to IG, but am unsure that results in any additional traffic here, to my weblog. I do not receive any meaningful feedback from my posts on IG. I am pretty serious about photography and work every year to improve my sight and my skills. I post a few captures on IG because it’s quick and I enjoy it. But I have only a couple hundred followers. Therefore, I question whether it is worth the effort to continue the IG exercise or to refocus that energy to working here on my personal webspace. Perhaps I should think about my goals for IG and how those goals fit into my goals for this website. If my photographs are print-worthy, then I could generate some income to offset the cost of equipment and travel to make more captures of interesting places, people, and things. But, I digress in my stream-of-consciousness fashion. I was really thinking about the social media addiction (a dopamine hit addiction) that so many of us suffer. I followed FB pretty closely for awhile, before a writer I admire referred to it as “an exercise in abnormal psychology.” That captured my attention, along with reading about Fear-Of-Missing-Out (AKA FOMO) and I realized that I was really missing very little, with few exceptions. Avoiding FB resulted in an immediate drop in frustration level (and probably blood pressure) from all that mess. When FB bought IG I was deeply concerned. I loved the way my follows showed up in the feed when I checked in. I could quickly and easily determine what was new and have a look at the work of creatives I enjoy. When FB abandoned the chronological feed for something far more obscure I was deeply disappointed. Now they are becoming more adamant about showing me feeds that I might like and sponsored posts that want me to buy something. It is becoming unbearable. The last couple of major elections reinforced my thoughts when I saw how nasty people were on FB. It was a moment when I eschewed the platform, for the most part, only visiting now and again after posting something here to see if I had comments that needed response. So where does this leave my thoughts? Well, I will continue to use the social media platforms on my current list. I might move much of my photographic work here and post less on IG. I will certainly maintain my distance from FB as that problem of psychology I mentioned. Twitter and SnapChat are not big consumers of my time and energy, so there really isn’t much to do there. And then there is Ello. I have an account there I do not use much. There are many creatives on Ello. But I do not really grok the platform. Perhaps Ello deserves a little more attention as far as posting my images and some supporting text. If one of my goals is to reach a wider audience with my photographs and my words, then that might be an approach. It is clear that neither IG nor FB is a viable solution. They are both crowded spaces and the algorithms are not intended to provide creators with outreach; the algorithms are intended to keep users hooked and increase revenues. That sounds cynical, but it is what I believe. It seems I have some additional work to do. But perhaps I better get The Girl out and make a capture for today. I am certain I can find something to catch my eye…. I still enjoy the IG platform along with your photos. I’ve found that when I use the location feature, I often attract a few additional followers. I am, for the most part, moving to a very limited presence on FB. The platform invites too much drama. I suspect that some drama is okay, but it doesn’t foster an environment to research and support an opinion. I need to maintain my presence because of some very close friends in other countries.